I’m still being struck down with the swine/avian flu/consumption, my cough echoing down the cubicle halls. But, the blog goes on. Let’s take a little trip back in the time machine and reminisce about ye olden days, when The Poe Log was just a twinkle in somebody’s eye. The name I really, really wanted was Notorious P.O.E. 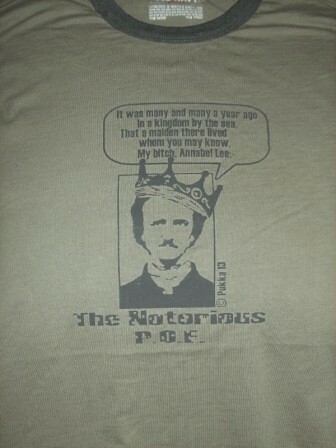 But wouldn’t you know it, somebody was already out there frontin’ as Notorious P.O.E. And somebody else was already using it on Twitter! And, even on MySpace! Let’s find out a bit more about these fellow Poes, shall we? First, there is Notorious P.O.E the rapper and DJ from St. Louis. 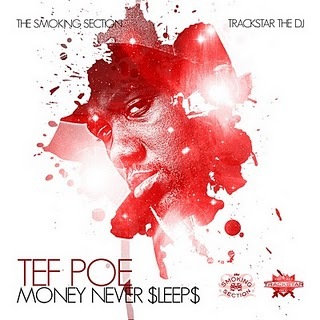 He’s Tef Poe and he has a blog, but it hasn’t been updated since November 2010. Looking back on his first posts in 2008, he REALLY does not like Palin. 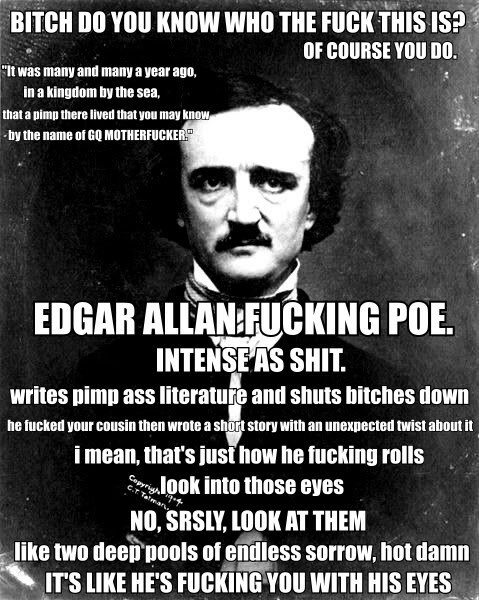 Rock on, my Poe brother. I concur, fine sir. I intend to write in GUCCI MANE on the next election ballot. On MySpace, we have the very elusive Tyler Poe, AKA The Notorious P.O.E. Unfortunately, his profile is only viewable by friends. Rude! And then there’s Twitter, where NotoriousPOE is one Dustin Poe. He had a short-lived interest in Twitter. Only 10 poignant tweets and three followers. His first post was worthy of our rapper friend above: “chasing dreams and destroying convention making life my own invention.” WORD. His last post: “the great thing about having an open mind is that you can always change it;” and then he was gone. Guess he changed his mind about Twitter? If you had a rap name, what would it be? Also: if you had a wrap named after you, what would you call it? This is a poster I also found by one "naughty by niemczyk." It seemed appropriate.